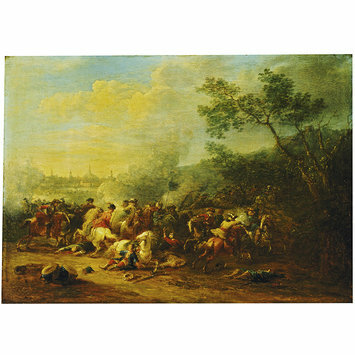 Jan Pieter van Bredael (1683-1735) was born in Antwerp but settled in Prague in 1706 to work for Prince Eugene of Savoy, for whom he painted battle and hunting scenes. He specialised in cavalry scenes and was active in Antwerp from 1720, where he was a member of the Guild of St Luke. A companion piece to 548-1870 showing an episode of warfare probably during the war against the Turks declared in 1715. The costume of part of the soldiers indicates they are Saracens or Turks and the whole scene looks more like an ambush rather than a proper battle. Characteristics of Jan Pieter van Bredael are the lively colours and the relatively loose brushwork. The majority of his compositions show generic ambushes and skirmishes quite difficult to relate to any precise battle. 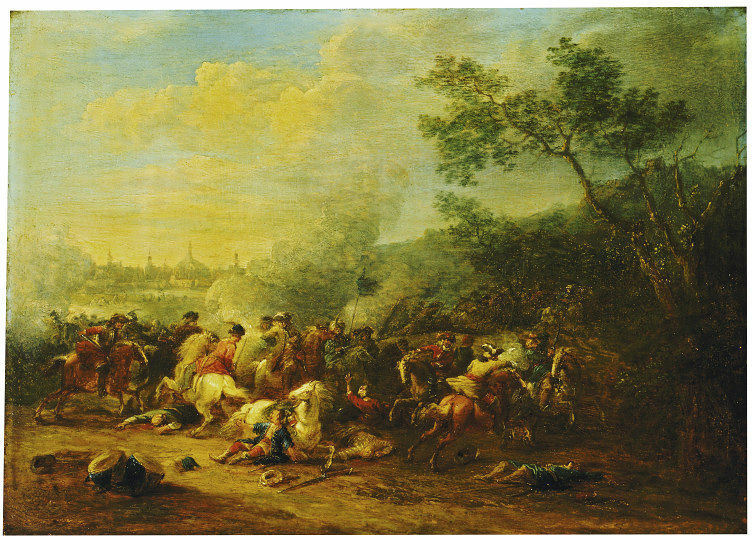 A fray between Turks and European soldiers in the foreground with trees on the right-hand side and a city in the background. John Meeson Parsons (1798-1870), art collector, was born in Newport, Shropshire. He later settled in London, and became a member of the stock exchange. His interest in railways led to his election as an associate of the Institution of Civil Engineers in 1839, and he was director or chairman of two railway companies between 1843 and 1848. Much of his time however was spent collecting pictures and works of art. In his will he offered his collection of mostly German and Dutch schools to the National Gallery (which selected only three works) and to the Department of Science and Art at South Kensington, later the Victoria and Albert Museum. The South Kensington Museum acquired ninety-two oil paintings and forty-seven watercolours. A number of engravings were also left to the British Museum. 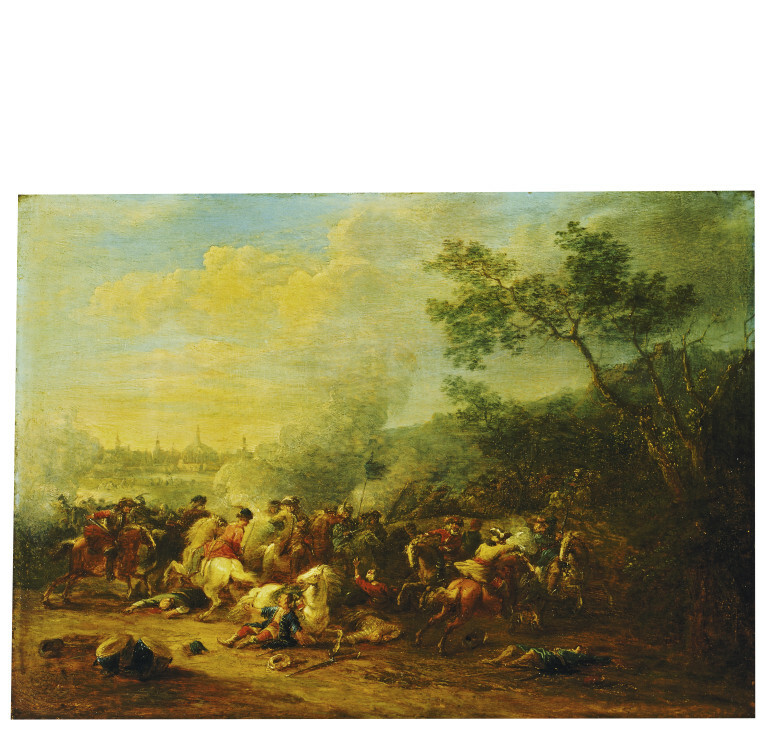 Historical significance: Jan Pieter van Bredael depicted a large number of battles scenes, especially showing scenes of the military campaigns of Prince Eugene of Savoy to which he was attached as a court painter. The small size of this painting and his companion piece, Cavalry engagement against the Turks with a church in the background (548-1870), is typical of the style of the Haarlem painter Philips Wourwerman (1619-1668) that produced many small cabinet pictures depicting generic battle scenes. At the beginning of the 18th century, the Turks under Sultan Ahmet III were still trying to extend their empire westwards, although back in the mid-1680s they had failed to take Vienna in a famous siege. War was declared against Austria again in 1715, and in the following years Prince Eugene of Savoy fought a number of successful battles against them. Peace was signed in 1718 with the Treaty of Passarowitch, and Hungary was thereby liberated from Turkish rule. The Turks, although no longer led into battle by the Sultan in person, had stuck to their once formidable traditional methods of warfare. These became progressively less effective against forces led by modern generals such as Prince Eugene. Comparative works by Jan Peter van Bredael such as the Battle of Petervardino and the Battle of belgrado can be found in the Kunsthisthorisches Museum of Vienna. In Italy the classical tradition of battles scenes goes back to the Roman low-reliefs and mosaics such as the Victory of Alexander the Great on Darius in Pompeii, and persisted in medieval miniatures, in the 14th and 15th centuries' frescoes and in decorations on the Renaissance cassoni (i.e. wedding chests) up to such works as Pietro da Cortona's Victory of Alexander over Darius, 1635, Museo Capitolino, Rome, and Salvator Rosa's Battle Scene, 1652, Louvre, Paris). In the 17th century however, Aniello Falcone, perhaps the first Italian battle specialist, introduced a new category of small battle, the battle scene 'without a hero' (F. Saxl) and usually without a specific topic beyond a generalized study of cavalry skirmishes between generic Christians and exotically clad Saracens or Turks. This speciality was developed by Neapolitan artists such as Carlo Coppola, Andrea di Lione and Salvator Rosa and in Florence by Giacomo Cortese. In the Netherlands, following the recent episodes of war that marked the progressive independence of the Low Countries (Eighty Years' War 1568-1648), Philips Wouwerman (1619-1668) painted generic skirmishes and ambushes (using northern settings, clothing and weapons) and he concentrated on genre scenes of crowded camp life. Tapestries also allowed this genre to develop and were now used as official military art and formed high-class mass production. In Rome, the Bamboccianti, i.e. Netehrlandish followers of Pieter van Laer nicknamed Bamboccio, were particularly interested in this genre.